About Abracadabra - Abracadabra Presentation Graphics, Inc.
December 2009 marks Abracadabra's 30th Anniversary! 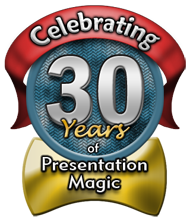 As of December 19th Abracadabra has been creating Presentation Magic in Orange County for 30 years! To commemorate the event we created a special 30th Anniversary Holiday Card, blending our immeasurable pride at turning 30 with our quirky take on holiday greetings. Our clients tell us the anticipation of receiving our signature greeting card has become an annual holiday tradition. In celebrating our Anniversary, we invite you to take a look back at some of our other Custom Holiday Greeting Cards from the last 30 years. Abracadabra is a group of presentation specialists dedicated to helping you find the most effect way of delivering your message. We immerse ourselves in presentations and presentation technology in order to maintain our status as the go-to source for audio-visual solutions. We pride ourselves on delivering for our clients professional, flawlessly executed meetings to successfully achieve their messaging goals. Abracadabra was established in December of 1979 with the intention of servicing Orange County's emerging automotive, biotech, pharmaceutical and advertising industries. The company's initial service offering was 35mm slide presentations created with innovative optical special effects. Complimenting the slide design service, we began to specialize in precisely aligned stacked-projector multimedia presentations controlled with data tracks from reel-to-reel audio-tape players. The exacting tolerances and creativity necessary to design 9-projector multiple framed and animated presentations was a perfect fit for Abracadabra's aggressive ingenuity. By 1985, Abracadabra had added video production services as a further extension of it's always developing presentation expertise. Throughout the 80's we acquired state-of-the-art digital imagers for the automation of 35mm slide production.